As we saw in the previous account of the beginnings of the Washington Medallion Pen Company, the late 1850’s was a busy time for this new manufacturer. With aggressive marketing, they managed to spread the market for the Washington Medallion pens across the east coast and into the mid-west. It seems, though, that by late 1860, the pen business was not doing so well for Albert Granger and the other officers of the Washington Medallion Pen company. In a later statement, Harrison and Bradford claim that in December of 1860, Washington Medallion may have stopped making pens altogether. What is clear is that in 1862, George Harrison and George Bradford formed their own company, Harrison & Bradford, and purchased from their former employer, Washington Medallion, all the machines, dies and tools to make the Washington Medallion Pens and began to make the pens under contract to the Washington Medallion Pen Company. They claimed that the machines had been “lying idle for fifteen months” when they began production in March of 1862. Harrison & Bradford not only manufactured the Harrison & Bradford Washington Medallion Pen, copying the look of the pen, as well as the look of the box, but they also began to make their own line of pens during this period. Later, in 1864, just months after they began production of their own version of the pen, the Washington Medallion Pen Co. filed suit against Harrison & Bradford in New York State Supreme Court for trade mark infringement. Washington Medallion Pen Co. vs. Harrison, Bradford, et. al. The law suit was accompanied by an injunction forbidding H&B from making any more Washington Medallion pens. It also named Eberhard Faber and Faber’s partner in the stationery business, James B. Hodgskin, as part of the suit since Eberhard Faber were Harrison & Bradford’s sole agents for selling these pens, as well as their self-branded Harrison & Bradford pens. In 1864 we we see a flurry of announcements and articles about this law suit in the New York Herald. First, on July 19th an announcement appeared that said that the defendants had filed a motion to lift the injunction, and since the plaintiffs were not ready yet for trial, the judge lifted the injunction, allowing the defendants to continue selling the pens. Two days later, on the fourth appeared announcements in the New York Herald. First, the plaintiffs’ lawyers. The article in your paper of August 2, headed “The Steel Pen Controversy,” is reference to the above suit, is so worded as to leave an impression on the mind of the public that there has been a final hearing and trial therein. This is not so. The injunction refused was merely a temporary one, asked for pending the litigation, and its refusal has no effect whatsoever upon the merits of the case. The judge who granted the motion gave no opinion whatever, and his decision is embraced in his endorsement on the papers, “Motion granted, injunction dissolved.” He probably deemed the defendant’s denial of all the equities of plaintiff’s bill sufficient reason for the dissolution of the ex parte injunction. The case will be tried in the fall, and the result of that trial will alone determine whether the plaintiff is or is not entitled to use the words “Washington Medallion” as its trade mark. Abbett & Fuller, Plaintiff’s Attorneys. Just over a week later, we hear from the other side. Washington Medallion Pen. – An advertisement appeared in the special notices of the New York Herald of August 4, emanating from the so called Washington Medallion Pen Company, which is calculated to deceive dealers and the public. As it has ever been and is our desire to protect the public from deceit, we state that the so-styled Washington Medallion Pen Company have not made a pen of any description since 1860. The pen works of said company, after lying idle for fifteen months, were, with all original dies, tools and machinery, requisite for making said pens sold to us on March 11, 1862. Since that time the said pens have been manufactured by ourselves and by no one else. We repeat our caution to purchasers that the only genuine Washington Medallion Pen is that inscribed, “Harrison & Bradford’s Washington Medallion Pen.” the so-called Washington Medallion Pen Company obtained an ex parte affidavit, an injunction restraining us from making and vending said pens, which injunction was, on our application, and after hearing both sides, dissolved by his Honor G. G. Barnard as reported in the Herald of August 2. What starts to become clear is that Albert Granger held the design patent, and licensed it to the Washington Medallion Pen Company. In 1860 the Washington Medallion Pen Company slowed or stopped production of the pens, and in 1862 they sold the machines, tools and dies to Harrison and Bradford who had formed their own company for making pens in the same location as the former Washington Medallion Pen company’s factory, at 136 W. 37th St. in New York City. So, what happened to Granger and the Washington Medallion Pen Company around 1860-62 that would cause them to sell the machinery, dies, etc… used to make their eponymous product? We get a hint of what happened in the testimony of a later lawsuit, from 1867. This lawsuit is brought by a Rufus K. McHarg against the Washington Medallion Pen Company. According to the testimony of the various parties it appears that around 1861, Albert Granger, the Secretary of the Washington Medallion Pen Company was going bankrupt. He and Rufus K. McHarg decided that this new war (American Civil War) might provide a way to make some money. We know from the Harrison and Bradford case, that in 1862 the machinery from the Washington Medallion company was sold to Harrison & Bradford. It may be that with this money, and money lent by McHarg, Granger went into the business of making gun-sights he hoped to sell to the government. As collateral for this loan from McHarg, he took out a mortgage on the gun-sight machinery as owned by the Washington Medallion Pen Company. So, Granger thought he could sent up his own business making gun-sights instead of pens, sold the pen machinery to H&B, borrowed money mortgaged against assets of the Washington Medallion Pen company, and then the gun sights never sold to the government. They were returned as defective. Meanwhile, McHarg had bought up other judgments against Granger (who, it will be remembered, is going backrupt) and then confronted Granger with both these judgments as well as information that it was illegal for a corporation to mortgage it’s own property, and demanded to foreclose on the mortgage and claim the machinery. This brought the whole enterprise into the open. Washington Medallion’s attorneys, Abbott and Fuller, got engaged and the case went to trial. The judge eventually ruled that Granger had made this deal without the formal approval of the board of Washington Medallion, and that it went far beyond the articles of incorporation, which were for making steel pens not gun sights. The judge also determined that the plaintiff had already received more than the amount of the original note plus interest. So, the suit was dropped in favor of the defendants. Washington Medallion vs. Harrison, Bradford, et. al. gets a judgment. In the case against Harrison and Bradford, the plaintiffs pointed to the defendants not just making pens with the Washington Medallion name, and containing the medallion of Washington’s head, but also to the form and decoration of the boxes in which they sold their pens. They submitted multiple exhibits showing the similarities. As you can see below from photos of the actual exhibits from the court case, the similarities are striking. It is clear that Harrison and Bradford fully intended for people to think that these were the real Washington Medallion Pens. And it’s clear from the text on the back of their box that they felt it truly was the one and only Washington Medallion Pen. The text on the back of the Harrison and Bradford Washington Medallion Pen box. Messrs. Harrison & Bradford, beg to inform Dealers and the public generally, that the Patent claim on the enclosed Pens, expired on the 15th day of April 1863. They would also inform all parties that on the 11th day of March 1862 they purchased from the Patentee, All the Original Dies, Tools & Machinery for Manufacturing the Washington Medallion Pen, and they Manufactured the same until the 15th day of December 1863 under Contract. We now put all Washington Medallion Pens before the public with our own name in full “HARRISON & BRADFORD’S WASHINGTON MEDALLION PEN” All Pens not bearing our STamp, will be imitations only of the the Original & Genuine Pen. Manufactured at 136 West 37th St. N.Y.
N.B. Be sure and see that the Pens are stamped “Harrison & Bradford’s Washington Medallion Pen” only the Pens so stamped are the Original and Genuine Pens. They made a profit of about $0.10 (ten cents) per gross on a price of $1.50 per gross (margins were so low because they were competing with British manufacturers who had much lower manufacturing costs so could sell their pens cheaper). As a reference, a decade later Esterbrook was selling their top-selling pen, the 048 Falcon, for $0.75 per gross. Harrison & Bradford went on to a successful business making their own pens for another decade or more. In the immediate aftermath, though, they separated from Eberhard Faber and began selling their own pens directly. It then attaches a price list for their Harrison & Bradford pens. The price list still includes the Washington Medallion pen, which shows that the letter and list pre-dates the ruling earlier that year. This just proves that Harrison & Bradford had not put all of their pen-making eggs in the Washington Medallion basket and were making a full line of pens, which is at least partially why they continued in business even after being forced to stop making Washington Medallion pens. Washington Medallion was not finished with lawsuits in the 1860’s. They also brought suit against another upstart pen company copying their designs, the Esterbrook Steel Pen Manufacturing Company. Washington Medallion Pen Co. v. Esterbrook, Case No. 17,246a, Circuit Court, S.D. New York, 29 F. Cas. 366; 1869 U.S. App. LEXIS 1173; MS, 1869. In 1868, a Federal Court in New Jersey handed down a judgement against Esterbrook that created federal precedent and was quoted in legal textbooks on trade mark law for many decades after. Washington Medallion Pen Company vs. The Esterbrook Steel Pen Manufacturing Company went beyond protecting their name, as was the core of the suit against Harrison and Bradford. In this case they sued to extend trade mark protection to their emblems, packaging and other “distinguishing features” of their pens. … forthwith to desist from directly or indirectly stamping or causing to be stamped on pens, or selling or vending pens on which are stamped the words “Washington Medallion” or either of them; also from stamping or causing to be stamped on pens, or selling or vending pens on which are stamped a head in profile or otherwise surrounded by a rim forming a medallion mark; also from putting up, or packing, or selling, or vending pens on any denomination or description, in boxes of the same or similar construction as the boxes originally adopted by the Washington Medallion Pen Company in the year 1857; also from covering pen-boxes of any form or structure with labels of the same colors or colors of the same nature or appearance as the colors originally adopted by the Washington Medallion Pen Company; also from printing or causing to be printed on labels of pen-boxes the phrases, “Let Americans write with American pens,” and “Our country now and forever,” or any transposition of the words composing these phrases, or any phrases of like import, or any fanciful ornamentation in colorable imitation of those used by the Washington Medallion Pen Company on the labels of their boxes; also from selling or vending any pens or boxes of pens on which are stamped, pressed, cut, printed or engraved any of the aforementioned trade-marks of the Washington Medallion Pen Company. The case was found in the favor of Washington Medallion setting a federal precedent for what was and what was not covered under a trade-mark. At this time there was no federal trade mark protection, only on a state-by-state basis could your trade makrs be protected. This finding in federal court led the way to the first federal trade mark law in 1871. Between this and a later case in 1872 against Esterbrook by Gillott of the UK, which Esterbrook also lost, US trade mark law was defined in the early years. By 1869 Albert Granger finally declares bankruptcy. By 1870 he is no longer associated with Washington Medallion. But the company must have purchased a perpetual license for making the pens because they continue to be sold nationally up through the 1880’s, including as far away as Honolulu, Hawaii in 1872. Even in 1881, they continue to use the lawsuits to promote the popularity of the pen as seen in this ad which ran in the main trade publications of the time: Geyer’s and American Stationer. Albert Granger died in 1906, and Albert Eastman in 1891. By the 1870’s, Fuller and Abbott had moved from lawyers for the company to officers of the same. In an annual report from 1878, Fuller is noted as the President of the Washington Medallion Pen Company. When the company finally folded is not clear. But by the mid-1880’s no more evidence can be found of the company or advertisements or even requests for proposals, which usually last longer than the companies. Harrison and Bradford go on to not only run their own successful pen company, but eventually break up and go on to help found two other major pen manufacturers in the latter decades of the 19th, and into the 20th-centuries: Turner & Harrison, and Miller Brothers. By 1890, the company who set so many “first” in the US steel pen industry, including the first to bring British tool makers, the first to advertise nationally, the first to assert trade mark protections in court, etc… finally passed into obscurity during the golden age of steel pens in the US. What is amazing is that a company who only ever made one style of pen would be able to last as long as it did. A testament to the quality of the pens and the loyalty of their customers. I wish to offer special thanks to Fountain Pen Network user Welch who so graciously took the time to go to the courthouse archive in New York City and photographed the records of the trial against Harrison & Bradford. This part of steel pen history would have been woefully incomplete without his hours and hours wrestling stiff, old documents which probably hadn’t been looked at since they were filed in 1867. And for those who may be interested in the transcriptions, I have transcribed, to the best of my ability, these old documents, and included the primary ones in a single document. In 1855, a group of merchants and investors in New York City incorporated to form the American Steel Pen Manufacturing Company. I’ve seen one example of their pens. It takes a standard form found in British pens of the time known as an Albata Pen. The pen itself, despite its rather poor condition, shows evidence of quality workmanship, like a double, or parallel grind. On April 15, 1856, the Secretary of the company, Albert Granger, was granted a design patent (Design Patent, April 15, 1856, D000780) for a pen that included a medallion of George Washington on the body of the pen. They named it the Washington Medallion Pen. They began to produce and sell this pen immediately. I’ve found no evidence that the American Steel Pen Manufacturing Company sold any other pens once they developed the Washington Medallion Pen. And there is evidence that they dropped all former designs to produce only this new one for the rest of their history. In an article in the April, 1857 issue of United States Magazine titled “How Steel Pens are Made: A visit to the manufactory of the Washington Medallion Steel Pen Company” which we have already seen contains a history of pens before the 1850’s, and to which we will come back for a more detailed examination in a later post, it mentions that the Washington Medallion Pen Company is a company who eschews the “variety” offered by other companies and instead adopts “the principle that variety is not a necessity with the consumer – but, on the contrary, uniformity in excellence and designation would more certainly meet the great public desire…” In other words, we’re only going to make one type of pen, and make it with the very highest quality workmanship and consistency. On the 10th of February, 1857, the Washington Medallion Pen Company was incorporated under the laws of the city, county and state of New York. It was subject to the control of the owners of the American Steel Pen Manufacturing Company. And in the nationally distributed North American Review magazine. and yes, that’s newly elected President James Buchanan writing from his home in Wheatland, Pennsylvania just after he was elected President, and only a couple of months before taking office in March of 1857. There is one common element you find in all of the ads: the stress on Washington Medallion Pens being made in America and the importance of using American Pens for American uses. Leaving aside the patently false claim that it’s the only pen made in America at the time (let alone the claim in the first ad above that it was the “first steel pen manufactory“), Washington Medallion made as a centerpiece of their marketing and identity that they are an American pen, made in America, by Americans. This reflects the strong nativist movement that grew in the 1840’s-50’s that is most often noted for it’s reaction against immigration, but also resulted in a push to buy American products over foreign imports. It’s interesting to see the company often quote statistics of how much American money is being sent to Britain to buy British pens. President Buchanan is only responding to a strong pro-American sentiment when he finds it instructive that we’re sending $1,000,000 a year to Britain. And, it’s curious to note how the claim grew from $500,000 a year in the early 1857 ads, to $1,000,000 by the late 1857 ads. Did they get better data, or was a half-million not quite enough, but a nice, round million-dollars was more striking? There’s no way I’ve found to confirm or dispute this amount, and considering the validity of their other claim to being the sole pen made in America (Myer Phineas was making his pens just blocks away from Washington Medallion), I’m not inclined to completely believe their numbers at face value. Regardless of the actual total, it was true that British pens dominated the market and no American pen had been able to successfully compete on a large scale before. During the last two years not only has the acme of excellence been produced in the manufacture of American steel pens, but their decided superiority is rapidly checking importations, thus distributing among our own people over one million dollars per annum that formerly went abroad. The next section, telling the origin story for the company, is worth quoting in full to give you an idea of the tone of heroic narrative they seemed to favor when telling their story. This national triumph has been accomplished by a number of able and spirited individuals, who associated themselves together, according to the General Manufacturing Law of New York, under the title of “The Washington Medallion Pen Company.” They commenced operations by erecting a substantial factory on Thirty-seventh street, between Seventh and Eighth avenues, in this city. After securing “competent artisans,” they, at an early day, discovered the rock on which all their predecessors were wrecked – adherence to English styles and trade-marks – which necessitated a competition in the market at the prices at which English pens were offered; presenting no new feature to the consumers, they could not attract the notice of the people or engage the interests of the merchants. To sail clear of this rock the efforts of this Company were directed. Adopting the principle that variety is not a necessity with the consumer – but, on the contrary, uniformity in excellence and designation would more certainly meet the great public desire – it instituted thorough experiments with all known styles of steel pens, and made several entirely new shapes, with the view to ascertain what shape would produce the most natural and generally agreeable action. With this view, and after fully six months devoted to experiments, they perfected a pen of unrivaled shape and excellence – to protect which from infringement they adopted as a trademark a medallion head of Washington; this is secured by letters patent, and is stamped on every pen. Thus fully comprehending the underlying principles of this important branch of manufactures, and boldly striking out a new path in accordance with them, this Company has firmly planted this new interest on American soil. Let’s unpack some of this. They can’t have been in the states for very long because in the 1851 British census we find them still in Birmingham. George Bradford, 22, living with his widowed father, George. The senior George’s trade is listed as “penholder maker” and George Jr. and his older brother John are identified as “pen tool makers.” He lived at 48 William St. in Birmingham with his father and 6 other siblings. The most likely candidate for our George Harrison in the 1851 English census is the son of Joseph Harrison (retired silver maker) and Mary. They all live at 66 Garrison Lane, Aston, Birmingham. At age 22 he is listed as a toolmaker along with his two brothers in the same trade. How Harrison and Bradford arrived in the US is still a mystery. Whether they took ship in hopes of finding their fortune, or if they were recruited by one of the principles of the company to come to America and help them start a new pen company, we may never know. We do know that Albert Eastman, the President of the new American Steel Pen company, was also involved in importing silks and other fancy goods. Most of the fancy goods sold in the US of the time were made in England, so it’s not unreasonable to think that either he visited there, or had extensive contacts in the country to effect this recruitment. Until we can find a record of immigration, it will be difficult to determine when and how they arrived in the US. Birmingham was the epicenter of the largest manufacturers of pens in the world, but that also meant there were a lot of young men being trained in the specialized trade, with, most likely, not enough job openings for a well-trained tool maker. We know, from the biography of another steel pen maker from Birmingham who came to America just a few years later, John Turner, that after his apprenticeship in the English manufactories, he went overseas to France to learn how they made pens there. Other countries who were just starting to get their pen industries off the ground would have been tempting locations to try your luck and see if you could make it big in a new market. America, with its large population, high literacy rate, who was hungry for British pens, was ripe for a new pen manufacturer run under English methods and using the latest tools and techniques from Birmingham. Harrison and Bradford were just the men to help. And why would Granger, et. al. go all the way to England to find someone to help them make pens? The answer lies in the same article from the United States Magazine. Of course, it’s highly likely that Harrison and Bradford had some say in the following description of the importance of the tool maker in the pen industry. Thus is how Harrison & Bradford are seen, at least by themselves, but it’s not far from the truth. Past pen-making enterprises were less able to get the right level of flexibility and finish to allow them to compete with the British pens. But all of them had relied on American tools and American tool makers. Washington Medallion showed the value of bringing British tool makers from Birmingham, and making the tools here, in the British style. This is a pattern followed a few years later by Richard Esterbrook. By 1859, you no longer find Washington Medallion directly advertising. Stationers will still advertise them, but you find no more advertisements until 1860. 1860 is a crucial year for the Washington Medallion Pen Company, as we will see in our next post. We’ve covered the history of steel pens in the US from the early days up through the 1840’s. The 1850’s is when we see the beginnings of the major companies that dominate the US pen industry for the next 70 years, and the opening scenes of the Golden Age of steel pen production in the US. The first of these companies I will cover, the Washington Medallion Pen Company, was dominate for a shorter time, but they were very influential in their advertising as well as their emphasis on being an American company, distinct from the British imports which were flooding the market at the time. The Washington Medallion Pen Company is also important to the history of the US steel pen industry because of the people who worked there and the various legal fights which impacted and were impacted by some of the most important figures in writing implements in the US, including Esterbrook, Harrison & Bradford, and even Eberhard Faber. I’m going to start with a brief overview and summary of the company’s story. I will then create separate entries for each of the major periods of the company’s history, as well as show examples of their important ads, and touch upon some of the key lawsuits which impacted the direction of the industry. In 1855 some merchants from the City of New York, including Albert Granger, former owner of a dry goods establishment, and Albert L. Eastman, an importer of silks and fancy goods merchant, formed the American Steel Pen Manufacturing Company. Eastman was the President and Granger was the Secretary. On April 15, 1856, Albert Granger is granted a design patent for a steel pen that includes an embossed medallion showing the head of George Washington. The Washington Medallion Pen Company was incorporated in New York on 10 February 1857. 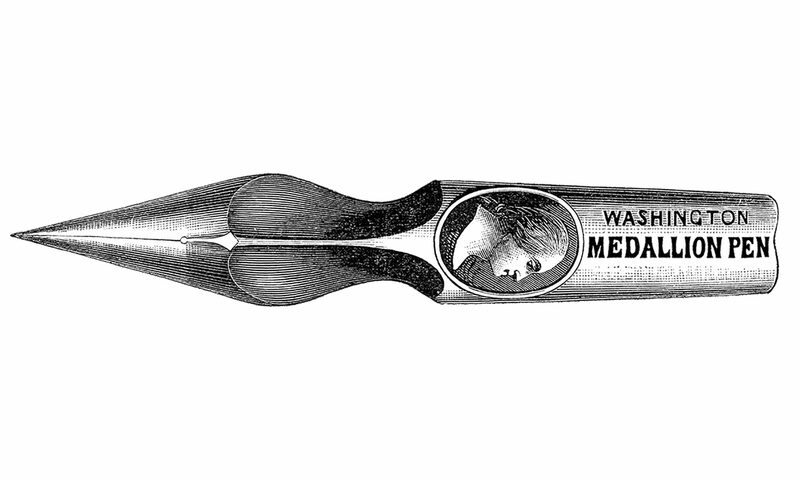 The Washington Medallion Pen was popular, and was sold into the 1880’s. This was the first long-term, successful, pen company in the US with a national market. In 1856 we are also introduced for the first time to two important figures in the history of American steel pens: George Harrison and George Bradford. In the NYC directory for 1856/57, these two young men are listed as toolmakers and live in the same boarding house on 141 W. 36th ST., just blocks from where their employer, The American Steel Pen Manufacturing Company was located. Harrison and Bradford were both from Birmingham, both trained in the pen factories there. Whether they were brought by Eastman and Granger, or they came and were recruited by the same, we’ll never know. What we do know is that these two young, trained toolmakers were soon followed by another group of experienced, British pen makers. These men, including John Turner, helped found the greatest US steel pen manufacturer, Esterbrook, just a few years later (1860) in Philadelphia. The pattern of importing experienced British tool makers and pen manufacturers, which helped make Esterbrook so successful, was originally set by The Washington Medallion Pen Company. Washington Medallion’s early years are marked by great self-promotion and advertising, a shameless appeal to nationalism, and financial and legal difficulties. Its middle years see a great deal of lawsuits and legal trouble, which eventually settles down into a gradual dissipating into relative obscurity while still producing pens. Eastman leaves the company sometime in the middle period and continues with his importing, silk and fancy goods business until his death in 1891. Granger stays with the company until around 1870. He lives on in retirement until passing away in 1909. Harrison and Bradford continue to exert a great influence on the pen industry until their deaths later in the century: both founding their own company, Harrison & Bradford, then later splitting up to help found the second largest pen company in the US (Turner & Harrison), as well as starting up the pen operations for another major manufacturer, Miller Brothers. More on their story later, but first lets look at the early years of the Washington Medallion Pen Company. The stub pointed pen was developed fairly early in the history of steel pens as an alternative to the sharp, pointed pen for people who wrote a great deal, and needed to write more quickly, with less effort. * A pointed pen, especially a flexible one, requires a lot of small movements up and down off the paper, even if it’s not terribly flexible, in addition to the two dimensions across the paper. This is because pointed pens require heavier and lighter touches depending on if you’re writing a down or upstroke. Upstrokes need to have a very light touch to prevent the tip from catching on the paper. Stub pens were advertised as a true replacement for the smooth writing quill pens. Most quills were not cut to a sharp point, but had a slight cross-cut made to the very tip. The steel stub pen mimics this cut. Italic or engrossing stubs differ from their rapid-writing cousins by the sharpness of their corners. The corner of the tip, affects both the smoothness of the writing, and the crispness of the line. For decorative writing, “engrossing” in the older terminology, you need a sharper corner to make a clean and thin line. For rapid and easy writing, you need a smoother, more rounded corner. This is one less thing to get caught in fast upstrokes and side strokes. The line also tends to be less crisp. Or the Esterbrook 239 Chancellors. This is a smaller sized stub that’s a lot of fun to write with. Very smooth and a long-time top seller as well. Or if you’re looking for a broader nib, the 313 Probate. Shelby Foote wrote his 3000+ page opus on the American Civil War using this pen. It’s what they used to call a “coarse” but we today call “broad” stub. For a finer stub, the 312 Judge’s quill, though I find the 239 and 314 much nicer to write with. Hunt made a very nice small size stub, almost identical to the 239, called the 62 (X-62 silverine model). I have a bunch of those and they are quite smooth and a lot of fun to use. For the medium size (length) stubs, I’m also fond of the Spencerian Society Stubs, which come up periodically on eBay. They’re flashy with their gold coating, and very high quality, as you expect from Spencerian nibs. Spencerian also made a very nice falcon stub called the Subway Stub that’s almost as good as the Jackson. And no discussion of stubs would be complete without mentioning the extraordinary Spencerian 28 Congressional. A medium-broad long stub pen, but what makes it so amazing is that it’s a fully flexible stub. Not everyone’s cup of tea, and not necessarily practical for everyday writing, but soooo much fun to write with. There are literally hundreds of styles, but these are some which are more commonly run across in online auctions and other sources of vintage stub dip pens. And perhaps honorable mention should also go to the less common, but very fun, Esterbrook 284 Blackstone stub. A very broad “signature stub” in a striking black coating. Writing with a dip stub is different than writing with a fountain pen stub nib. The best way to write, which gives you the best results is to change the orientation of the nib and paper so that the broad edge of the stub is parallel to the line of writing. With a dip stub, when you’re writing regular (i.e. cursive, not Italic) script, keep the nib parallel to the line of writing. This usually requires you to turn the page a bit, and keep your arms in towards your body. Here’s a comparison between a stub nib (Hunt x-62) on the left, and a pointed pen (Eagle E840 Modern Writing) on the right. The stub was held parallel to the line of writing. The Story of the Esterbrook #442 Jackson Stub. And as a historical side note (I can’t help myself sometimes), the introduction of Esterbrook’s famous 442 Jackson Stub has some little bit of drama around it. Here’s an ad from early in 1887 that shows the #12. In 1889, just a few years later, Leon Isaacs & Co. had a bit of a rough patch. And then in late October, Esterbrook, the 800-pound gorilla in the industry, makes the following announcement which, while not outright saying so, implies that they saw a need and invented a new pen to fill it. The “Falcon” is undoubtedly the most popular form of fine pointed steel pen ever put on the market. There has been a steady call for a pen of similar style, but with a stub point. In response to this the Esterbrook Pen Company has just put on the market a pen filling these requirements. This new pen is known as the “Jackson Stub,” and an illustration of it is presented herewith. The pen has a smooth, easy action, and possesses qualities which will commend it to those who wish a thoroughly effective pen for rapid writing. And then ran an ad featuring the new pen. In December, the new management of Leon Isaacs & Co. won’t let that lie. They come out with a new version of their advertisement which now highlights their falcon stub and includes the following new text. It’s interesting to note, that Esterbrook never uses the term Stub Falcon or Falcon Stub for decades after the introduction of the 442 Jackson Stub. You will find the term used by other companies later, 1930’s or so, but that is long after Leon Isaacs & Co was sold to Turner & Harrison, and long after any kind of trademark would have expired. A small victory for a company who had a very, very bad year in 1889. The first steel pens made in Birmingham about the year 1837, while providing a ready made instrument for penmen, failed to give that ease in writing which was the characteristic of the old quill. They were uniformly fine pointed and naturally more or less scratchy. The remedy for this was not found until a generation later, when the demand for an easier writing pen because imperative. Manufacturers began to make them with blunt and broad points. In 1871 the Esterbrook Steel Pen Company made its first stub pen, No. 161, and now the company has as many as eighteen numbers of stub pens on its catalogue. This did not completely satisfy the demands until the happy idea occurred to turn up the points. This rendered the evolution of the pen complete. In 1876 the Esterbrook Steel Pen Company produced its 1876 Telegraphic, followed shortly after by No. 256 Tecumseh, and No. 309 Choctaw. At the special request of many the Falcon pen was made in this style. Another pen has now been added to the list, and is known as No. 477 Postal. This is a size larger than the Choctaw, with finer points. The perfect ease afforded by these pens contributes one of the most valuable luxuries provided for writers at this end of the century. The penman can write longer with less fatigue than with the ordinary styles. The tediousness of writing is almost entirely avoided, and the relief is so complete that it converts a drudgery into a delight and a pain into a pleasure, and anyone who has taken up one of these turned up point pens for a companion will never consent to be without it. Pen History: The 1840’s, from the perspective of the 1850’s. I’ve been covering the history of steel pens up to the 1840’s based as much as possible on the primary sources I’ve been able to find. Up to the 1850’s, the industry had been too new for anyone to indulge in a retrospective. That changed with a new company who wanted to create an identity that placed themselves in opposition to all who had come before. This was the Washington Medallion Pen Company. I found this earliest attempt at taking a broader look at history of the US steel pen industry is found in an article in the United States Magazine issue for April of 1857 describing the factory of the Washington Medallion Pen Company. We’ll be looking at the whole article in another post, and we’ll be talking about the Washington Medallion Pen Company in much greater length elsewhere. At this point I want to look at the following selection from the article and we’ll see if we can trace it step-by-step. It’s important to remember that the author was not trying to paint an accurate, historical view of past pen makers, but was instead helping to build a narrative of the WMPC as something radically new in both its product as well as its success. Here’s the whole section. After, I’ll take each piece and see what we can find out from it. About the year 1840, steel pens having become in considerable demand in this country, and the fact of their almost universal adoption being already apparent, the cupidity of certain parties was excited, and they resolved to present steel pens of home manufacture for the public favor. The first effort was by a company in Massachusetts, who perfected some fair specimens for that early day; but, owning to inexperience and the absence of proper tools, tool makers, and a knowledge of slitting, tempering and finishing, their products lacked uniformity of quality; thus the enterprise failed. Soon after, two or three of the principle dealers in stationery in this city experimented in steel pen manufacture. We remember one of them who commenced operations in Brooklyn, and who, after expending some $15,000, followed in the wake of the Eastern Company. Another erected his works in New Jersey, and for some months battled manfully for success; finally he “felt” he must follow his illustrious predecessors. The late C.C. Wright, long known as a prominent engraver and die-sinker, made a most strenuous effort to permanently establish this manufacture. Through his influence, aided by J. C. Barnett, since well known as the treasurer of Burton’s Theater, a company was formed and a capital amounting to $200,000 expended. A large factory was erected on Fifth street, in this city, the most approved machinery and fixtures procured, operations commenced, and ten or twelve varieties of pens produced, many of them of excellent quality; yet, notwithstanding the impetus with which the affair was started, it met with no better success than those before mentioned. We learn of no attempts to resuscitate the business until 1852, when some Birmingham men, who claimed to be experts, induced certain capitalists in New Jersey to “try their money” in the operation. One after the other, two or three companies expended large amounts, each with no better pecuniary results than had been before arrived at. If you’ve been following the history so far, some of these references should be fairly obvious, but I’m going to look at them one-by-one. About the year 1840, steel pens having become in considerable demand in this country, and the fact of their almost universal adoption being already apparent, the cupidity of certain parties was excited, and they resolved to present steel pens of home manufacture for the public favor. As I mentioned in my original article on the 1840’s, the British had dominated the pen industry in the 1820’s and 1830’s, and it was in the 1840’s when Americans made a serious effort at manufacturing steel pens. I also mentioned the rising nativist movement of the time, stressing the importance of us buying and supporting American manufacturers. The first effort was by a company in Massachusetts, who perfected some fair specimens for that early day; but, owning to inexperience and the absence of proper tools, tool makers, and a knowledge of slitting, tempering and finishing, their products lacked uniformity of quality; thus the enterprise failed. This is obviously referring to Josiah Hayden. If you remember, he was trying to set up a steel pen factory out in Western Massachusetts. As far as I’ve been able to find out, he founded the manufactory with all American labor. He brought in mechanics and tool makers from elsewhere in Massachusetts, and from as far away as Connecticut, but as far as I can tell, he was relying on their past experience making steel buttons or cotton mills, or other general manufacturing. There are some similarities between making metal buttons (Hayden’s former product) and steel pens, and with Yankee ingenuity and inventiveness, they were able to figure out how to produce a decent product. The quality was good enough to win silver medals at the American Institute fairs, but then the competition was not very steep. Hayden didn’t last long making steel pens before he sold the business and went on to making gold pens, which was much more of a hand-operation and not as reliant on specialized machinery, dies and knowledge of steel tempering. Soon after, two or three of the principle dealers in stationery in this city experimented in steel pen manufacture. We remember one of them who commenced operations in Brooklyn, and who, after expending some $15,000, followed in the wake of the Eastern Company. Another erected his works in New Jersey, and for some months battled manfully for success; finally he “felt” he must follow his illustrious predecessors. This is an interesting section. Obviously the second is a reference to David Felt. Felt founded Feltville in New Jeresey as his factory town. Now, Felt was making pens as early as the 1830’s, so he doesn’t fit neatly into the “About the year 1840” narrative, but I’m not counting on this source to give me the most accurate dating. The real mystery is the reference to the first stationer. The only stationer who I know who had works in Brooklyn, besides Felt, was Herts & Sons. They had their stationery factory in Brooklyn, and Spooner, a stationer in Brooklyn, was one of their main dealers. It’s interesting that he doesn’t make any mention of Herts’ English antecedents, which may be a mark against Herts being the subject. This only really becomes significant within the context of Washington Medallion’s marketing campaign, which we’ll look at elsewhere, which strongly focused on the fact that these are American Pens, made by Americans, for Americans. The late C.C. Wright, long known as a prominent engraver and die-sinker, made a most strenuous effort to permanently establish this manufacture. Through his influence, aided by J. C. Barnett, since well known as the treasurer of Burton’s Theater, a company was formed and a capital amounting to $200,000 expended. A large factory was erected on Fifth street, in this city, the most approved machinery and fixtures procured, operations commenced, and ten or twelve varieties of pens produced, many of them of excellent quality; yet, notwithstanding the impetus with which the affair was started, it met with no better success than those before mentioned. We looked at C. C. Wright in some detail. The interesting information here was further identifying J.C. Barnett as the treasurer of Burton’s Theater. Burton’s Theater was one of the first Broadway theaters. The purpose of this section of the magazine article is to compare the operations of Washington Medallion favorably versus the prior efforts at pen making, so all former makers must, at some point, fail. The information we have from C. C. Wright experts, based on the accounts of his life from his grandson, is that C. C. Wright made his money making pens and then sold the business because he had made enough to spend the rest of his life doing what he really wanted to do, engraving and medal making. The truth may never be known, but it may be somewhere between the all good and all failure stories. At least they admit the pens were of high quality. We learn of no attempts to resuscitate the business until 1852, when some Birmingham men, who claimed to be experts, induced certain capitalists in New Jersey to “try their money” in the operation. One after the other, two or three companies expended large amounts, each with no better pecuniary results than had been before arrived at. This concluding passage is interesting in a couple of ways. One is that I have no solid idea who he’s talking about. Since this is written in 1857, he’s only talking about a five-year period in which two or three companies tried to start, spending lots of money, and failed. That seems rather a shortened time frame. If these really happened then they may have started and closed rather rapidly and left no real trail for me to find. The other interesting point is the fact that the author talks of “Birmingham men” coming in to provide expertise. This is interesting, because this is precisely the pattern we’re going to see in the next two decades, the 1850’s and 1860’s, where it’s transplanted Birmingham men, trained in the main British pen factories, who kick off the first real, sustained wave of successful steel pen businesses in the US. And the first is, ironically enough, the subject of this article, the Washington Medallion Pen Company. Pen History, the 1840’s: Rhodes/Rhoads mystery, transition to the 1850’s. When working through 1840’s steel pen advertisements, one will encounter a number of them that seem similar: Rhoads & Sons, Rhodes & Sons, Rhodes & Son, Rhoades & Son’s, Rhoad’s & Sons amalgam pen, patent amalgam pen, patent amalgam double action pens, patent amalgam quill spring pen. Besides pointing out the relative “flexibility” typesetters could have with spelling, we have to answer the question if it really is this “flexibility” to blame, or if there really were more than one similarly-named pen makers. This question has been plaguing my research for quite a while now, and as far as I can tell, after a great deal of searching, there was only one “Rhoads & Sons” and they were, more fully, Thomas Rhoads & Sons, stationers and manufacturers of pens, pencils, and stationery in London. They produced and sold a great many things, like most good London stationers at the time, ranging from sealing wax to chess sets, from ink wells to blank books. They are listed in London directories as located at 1 Vine St. and active from 1833-1880. As I looked over the ads that spanned from 1841 through the 1850’s, I find an interesting thing happening that seems to reflect a larger change in consumer tastes. The earliest ads did nothing but mention them along with other top British names. But when we look at the ads that came out in the 1850’s, we begin to see a significant change in marketing. These newer ads struck me as more like American pen ads. They were often very verbose about the benefits of the pen (see the first ad above), and highlighted the “newness” and inventiveness of the pens. Most ads for British pens, especially by the 1840’s, merely mention the pen, maybe introduce a new style, and a few anodyne phrases. British pens in the 1830’s and into the 1840’s were viewed as the premium quality pens, against which all others had to be measured. This is about as wordy as ads for British pens are in the 1840’s. This is a New York City stationer’s ad announcing the new Croton Pen from Gillott. But by the 1850’s, American pen makers were becoming more aggressive about both the quality of their pens, but also about being American pens, appealing to a newly insurgent nationalism that became prominent in the 1850’s. In their 1850’s ads, Rhoads didn’t trumpet their British origins, but instead felt the need to sell to the American public using similar language and styles as other American pens; focusing on innovation, new materials, and styles. As we move into the 1850’s and see the makers who started in this new decade sell their pens, we’ll see more, and more explicit appeals to the public to buy American pens because they are American. This 1856 ad give you a preview of what we will encounter in the 1850’s. Henry Benjamin Herts, born in 1794, was living in England when he had his family. His children included, his daughter Rachel (b. 1819), and his sons Henry B. Jr. (born May 26, 1823 in Nottingham, died 1884), Daniel born about 1825, Jacob, and Lewis. They were all born in England. In 1841 Henry Sr. opened a steel pen factory under the name H. B. Herts & Co, at 281 Bradford St. in Birmingham. According to Brian Jones’s book People, Pens & Production, the factory operated from 1841-1842. In 1843, at age 49, Henry Sr. came to the United States and settled in New York. He created a partnership with his sons Henry Jr. and Jacob called H. B. Herts & Sons. They set up a factory at 509 Broome St. in New York City where they manufactured stationery (probably blank books), pen holders, and maybe pens. The reason I say “maybe” is that while H.B. Herts & Sons is listed in various directories as a “manufacturer of metallic pens, penholders, stationery, &c” the advertisements promote the pens as being made in Birmingham. In a large ad in the Doggett’s directory of New York City for 1846-47, it explicitly says that the pens are made at the Bradford Works in Birmingham. This wasn’t the first pen they started advertising. The first ads in 1845 mention the Alpha Pen. In 1846 is when you first see the reference, above, to the amalgam pen you also find the claim “By Royal Letters Patent.” The only problem with this is that I cannot find a British (or American) patent that fits this pen. Perhaps someone else can find it, but it has eluded me. If you do find something you think works, let me know. Because of the superior quality of the pens, they claim that between December 1845 and December 1846, they sold 375,000 gross, or 45,000,000 of their pens. It is in this ad, as well, that they refer to their business address as the “manufacturer’s depot” and list not just their NYC address, but also 35 Cornhill in Boston. We can compare this 375,000 gross of pens Herts produced in 1845 with the 730,031 gross Gillott claimed to have made in 1843. Herts was no where near as large, but they were making quite a respectable number of pens nonetheless. The family stayed pretty close, literally, through the years of the business. When the directories show both business and home addresses, Henry B. Sr. is shown as living with at least one, and often two or even three of his sons in the same house over the years. There’s evidence that some of the sons made trips back to England in at least 1846 and 1849. It’s likely they kept the factory open in Birmingham and perhaps kept it running by other sons or relatives. Since we’ve not found evidence for the factory after Henry left in 1843, it’s not clear if they really still had their own factory, or just had pens stamped with their name by another maker, and just attributed them to their old Bradford Works. Regardless, they kept selling the pens as H. B. Herts & Sons until 1853 when Henry B. Sr. retired and the old company dissolved. The new company, “Herts Brothers” continued to sell pens as well as import stationery and fancy goods in their new office at 241 Broadway. An interesting ad/article in the March 2, 1854 Buffalo (NY) Morning Express gives us more information about the company. It talks about “Herts Brothers Amalgamated Iridium, Zinc and Platina Pens” and “The Messrs. Herts are at the head of the great house in Birmingham, England, for the manufacture of Metallic Pens. They employ about 500 persons in their extensive operations.” This pen is patented in England and the United States by ‘Herts Brothers.’ It is for sale at their splendid Emporium, 241 Broadway, as well as in different parts of the Union, England and France.” If they truly had 500 employees then they were quite a good sized company. The well-known D. Leonardt, one of the largest of the independent makers in Birmingham, had 500 employees at its height in the 1880-1890’s, and that included their own rolling steel operation. Alas, the “discerning public” did not flock to this pen, and in 1855, Herts Brothers was no longer listed. Jacob is still listed as a “stationer” but it does not tell us where, and Henry B. Jr. has set himself up in his own auction business. Interestingly, Henry B. Senior just can’t stay away from family, or completely in retirement. In the 1855 New York Census we find Henry B. Herts Sr. living with his daughter Rachel and her husband Jacob Davis. Both Jacob and Henry are listed as at the same business address with Henry labeled “jeweler” and Jacob as a watchmaker. Henry Sr. died about 1856. Henry Jr. lived until 1884 when he died on a trip to England at the age of 63. Many of his children went on to start up their own businesses including another Herts Brothers, this time Herts Brothers Furniture. The history of Henry Benjamin Herts still has some mysteries to be solved. It seems from the advertisements that the Herts family may still have had a factory making pens in Birmingham. It’s not clear if all of their pens were imported from that factory, or if some were made in the US, or if they got some from other Birmingham factories, or some combination of the three. Further research on the Birmingham side may be done, but the standard resources don’t mention the Herts family or the Bradford Works beyond that brief mention in Jones’ book. If they were as big and prosperous as the claims, then their omission from the standard histories is a significant one. We also still have the mysterious patent claims. I cannot find any record of patents claimed in England or the US. For now, it remains yet another mystery. Harry B. Herts came to America as so many others did, and while his pens seem to have, at least partly if not completely, been made in England, he chose America as his main marketplace as well as home. Because of that, I still consider H. B. Herts & Sons as another of the interesting American pen makers of the 1840’s. Pen History, 1840’s: Myer Phineas, the forgotten success story. Another stationer in the 1840’s to make his own pens was Myer Phineas. His name is not well-known, but in his day, he was one of the most successful, at least measured by longevity, pen makers in America up to that point. He made pens for 20 years in a wide variety, with several patents to his name, and prestigious customers like the War Department and the United States Senate. He was one of the few of the old stationers still remembered in a look back at the NY stationery trade in an article in the American Stationer in 1891. Myer Phineas was born about 1814 in either Poland or Russia. It’s not clear when he came to the United States, but by 1845 he owned a stationery and import business in downtown Manhattan, on Maiden Lane, and was already making his own pens. In 1842 and earlier, he does not appear in the business directories of New York City. I’ve yet to find one for 1843 or 1844, but it’s most likely in one of these years he begins Myer Phineas & Co. and begins to make pens. In the earliest ad, from 1845, he’s already making a wide variety of pens. This is nowhere near even weak evidence, especially since Wright supposedly kept making pens until 1847. One thing that is not a mystery is the success of his pens. We find his pens sold in New York through his own store, and by other stationers. In 1858, the Board of Education of the City of New York accepted bids to provide them with Myer Phineas pens, but Phineas himself was only successful in bidding to provide one number, the other four numbers were awarded to his rival stationer Willard Felt. In 1853, the War Department in Washington DC purchased his pens from the local (Washington DC) stationer R. Farnham. And in 1861, the United States Senate purchased 156 dozen of his pens. He seems to have focused mainly on commercial and financial customers, government and education. The most complete list of his pens is found in a catalog of a large supplier of educational textbooks, learning tools and other supplies. Ide & Dutton of Boston were a very large firm carrying many of the latest and most modern of educational supplies. In their 1855 catalog, this is the list of the only steel pens they offer. As you can see from the list, he also manufactured pen holders. The Accommodating Pen Holder was actually one of his own inventions. I have one example of a Myer Phineas in my collection. It is the only one I know of, but would love to find out that there are more out there. This is a #98 Spring Quill. It is a reddish bronze finish with delicate piercings and slits along the side which give it a nice, soft spring. It has an extensive double grind and what I would rate as a medium tip. It’s a well-made pen, and shows the good reputation of his pens was truly warranted. Myer Phineas was not only a successful stationer and pen maker, he was also an inventor. In 1853, he patents the design of a pen with slots or ribs cut into the top of the nib, held with strips along the side. This is to increase flexibility yet keep the pen stable and durable. This becomes his “500 Patent Double Spring” (see above) and is most likely the original design for later similar pens like the Esterbrook 126 Double Spring. The next year, in 1854, he patents a new kind of pen holder that allows for different sized nibs to be held firmly, yet with some spring. This is the Accommodating Pen Holder. I’m not sure what the “Extra Accommodating Pen Holder” is, but it’s most likely a slightly fancier version of the one he patented. Then in 1856 he patents a “fountain pen” which is what they called pens with built-in reservoirs before today’s fountain pens came along. It’s punched from a single sheet with a bend at the top to create a top reservoir, similar to the later Hunt design seen even today on modern Speedball calligraphy pens. Myer Phineas & Co. were located in Maiden lane and were well known. They were the patentees of an inkstand which has had an extensive sale. I’ve not found the original patent, but I have found one of the actual ink wells. What’s curious about this is that on the top it says it was patented and the patent was renewed Aug. 18, 1869. That’s interesting because that’s a year after Myer’s death in 1868. After 1868, his store either closed or changed names because it’s no longer found in city directories. His widow, Ellen, may have sold the business and allowed someone to continue to use Myer’s name to sell inkwells. Could they have continued to sell pens as well under his name? There is no evidence they did as there are no more ads or mentions of his pens after about 1859. It seems in later years he was selling to government agencies, as mentioned above. Myer Phineas was not only a businessman, but also a manufacturer and an inventor. He was able to develop a rather large line of pens and pen holders in addition to the other material he imported and sold. It’s a shame that his contribution to the new steel pen industry in the US was soon forgotten by most later “historians” of the steel pen trade, as we will see in later posts. He deserves to be remembered, and honored for being the longest-producing pen maker coming out of the 1840’s. In the 1830’s we saw Mark Felt, a prosperous stationer, try his hand at making pens. We’ve also seen Sampson Mordan over in England also start to make his own pens, as well as create innovations. This was not an isolated phenomenon. The 1840’s saw more stationers try and make their own pens. They had been selling the British pens and demand was growing. Already, by the 1830’s, it’s just accepted by most that the steel pen is the superior writing tool. In the 1840’s steel pens become big business for the stationers, and it’s not just the pens. There’s a proliferation of ads touting this paper or that ink as suitable for, or even designed for the steel pen. So, the stationers were well aware of how much money was being spent on steel pens, and how the market was growing. It’s no wonder a few of them try and get into the business. One of them who did, and succeeded for a bit, was Mark Levy and his brothers Henry and Lewis. By 1841, Mark, Henry and Lewis had formed Mark Levy & Brothers, selling stationery out of their “Cheap Stationery Warehouse” at 40 Maiden Lane, upstairs. They were also making and selling their own pens under the Mark Levy name. The Levy brothers used one of the standard practices of the day and sent samples of their pens to busy newspaper reporters and editors in the hopes that they might get a small bit of newsprint praising their pens. Well, it seems to have worked. By 1843 they had quite a collection of testimonials from newspapers around New York. One note about the picture of the pen at the top of this post. This may be the oldest pen in my collection, or at least one of the oldest. It came to me in a small assorted group of pens, none seemed to be newer than 1860’s. Many were in not so great shape, like the Levy pen, but considering their age, I kept every one. It’s not often you come across a 172-year-old steel pen. This is the one with the oldest verifiable date. You’ll be seeing a few more of them as we talk about the makers. Pen History, 1840’s: C. C. Wright & Co.
Charles Cushing Wright was born in Damariscotta, Maine in 1796. His early life was a story of hardship (orphaned!, abandoned! ), drama (poisoning! oppression!) and hard work to overcome a lack of formal education or familial support worthy of a 19th-century novel. Once in the city he partnered with another talented engraver, Asher Durand, and Durand’s older brother to form Durand and Wright. Working together for four years, from 1823-1827 they became important bank note engravers. Wright was a talented medalist (sculptor of medals and medallions), engraver and a die-sinker, the person who carves the dies used to make coins. Some consider him the premier American medalist as all of his training was in the US or self-taught. This 1848 medal commemorating Zachery Taylor’s victory over the Mexicans at Buena Vista is a good example of his work. Wright was also active in the artistic community in New York City. He and Durand, along with Samuel F.B. Morse (of Morse Code fame), Rembradt Peale, Thomas Cole, and others were in the group of young and talented artists who broke away from the American Academy of Fine Arts to eventually form the National Academy of Design, an influential honorary society of artists that is active to this day as the National Academy Museum and School. Through his work with the Academy he became friends with the well-known chemist James Mapes (father of the author Mary Mapes Dodge). Through Mapes, Wright came to know another chemist who had turned into an ink manufacturer, Thaddeus Davids. Davids had been making ink since 1825 and continued until 1889. Davids introduced Wright to the prosperous stationer David Felt. (see my post on the 1830’s when Felt had a short-run try at making his own steel pens under the name of Stationer’s Hall Pens.) For a time Wright was given a space in Felt’s workshops at 34 Wall St. to engrave seals for wealthy clients and make engraved plates to make custom labels. The fancier the engraving on a label, the harder it was to counterfeit. Monograms and seals were all the rage at the time, and Wright’s work was well-received. 1840 ad for David Felt advertising Wright’s medallion stamps. In 1842, James Mapes’ son, Charles Mapes, joined with Charles Wright and Joseph C. Barnet and together they formed a company for making steel pens. It is not unlikely that they may have started with David Felt’s old pen making equipment as we no longer find references to Stationer Hall pens by that point, and there’s no record of Felt selling his equipment before this time. I’m sure however they started, with Wright’s abilities as a die sinker and engraver, they soon made their own dies and they began making pens under the name of C. C. Wright & Co. They soon were offering a wide variety of pen shapes and types with over a dozen offered in 1844. They seem to have targeted especially businesses (like banking), and schools. His ads are often filled with testimonials about the quality of his pens from newspapers to whom he would send samples, from famous penmanship teachers, and from business folks. And in 1842, the same year they started making pens, C. C. Wright & Co. submitted a proposal to provide pens to the Treasury Department. Some of the references they used to get the attention of the Treasury Dept. included Judge Tallmudge, the city Recorder at the time, and “Professor [James] Mapes” who was to be in Washington DC and was going to drop off a few samples. The other references were W[illiam]. H. Cary & Co, importers of fancy goods, and Russell, Mattison and Taylor, one of the largest button manufacturers in NYC. In the proposal to the Treasury, they offered the following pens at the following prices. Pens on cards were provided at a dozen per card, a dozen cards per gross. Holders and Handles were also to be provided. At $1.75 and $1.60 per gross respectively. In early 1847 Charles Wright sold his business for a “tidy sum” which allowed him to focus full-time on his medals and other engraving projects. Unfortunately, Charles Wright died in 1854 at the relatively young age of 59. Where did he get the tools for making pens? The story that’s been passed down says that while at David Felt’s he saw first-hand the difficulties Felt had in importing British pens. I suspect it was more that he saw a wide variety of pens and realized that with the right tooling it was fairly easy to make pens, and his knowledge of steel and its properties could come in handy. At the time there, again, weren’t many American manufactures. Atwood was out before 1841, and Hayden was just getting started, as was Mark Levy and Rhodes & Sons. Felt could haven advised him that this was a way to make some money, which Wright was in need of. To whom did Wright sell the pen making equipment and the business? I doubt the machines just disappeared. If he sold the business for a “tidy sum” then someone bought the assets and most likely began making pens. A likely candidate has yet to materialize out of a few possible options. What did a C.C. Wright pens look like? Obviously some were imitations of other pens, but none have been found as far as I can tell. If anyone finds one or a picture of one, let me know. More people than just I would be interested. The 1840’s are shaping up to be an interesting decade. You start to have more serious artisans and industrialists trying their hand at pen making. It’s no long the inventor like Atwood, or stationer seeing if it’s cheaper to make than to buy, like Felt. This sets us up for a whole different breed of professional pen makers to come along in the 1850’s and 1860’s. * Many thanks go to Neil Musante, whose article in the Summer, 2014 issue of the MCA Advisory, the magazine for the Medal Collectors of America, was a source of tremendous help in the writing of this post, as was the personal correspondence with Mr. Musante who was generosity itself with his knowledge and help. Also, credit to the New York Historical Society who owns the amazing advertising note above.